Openness of communication, honesty of information, integrity of service and respect for all stakeholders – both customers and staff. We feel that these qualities make the difference at our dealership and for our customers. The 2019 Toyota Tundra comes with the choice of two V8 engines, both mated to a six-speed automatic transmission. The first is a 4.6-litre V8 which generates 310 hp and 327 ft.-lb. of torque. The second is a 5.7-litre V8 which creates 381 hp and 401 ft.-lb of torque, and features the largest displacement of any Toyota engine to date. Depending on the configuration the Tundra can provide up to 10,500 lbs (4,760 kg) of towing capacity, making almost any towing job a breeze. The front suspension is loaded with double wishbone suspension including coil springs, gas coils, and a stabilizer bar. The rear is no slouch offering multi-leaf springs and bias-mounted gas shocks. 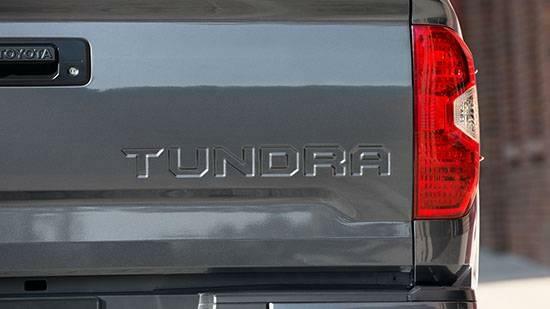 The Tundra offers a fuel efficiency rating of 17.3 L/100km in the city and 13 L/100km on the highway. 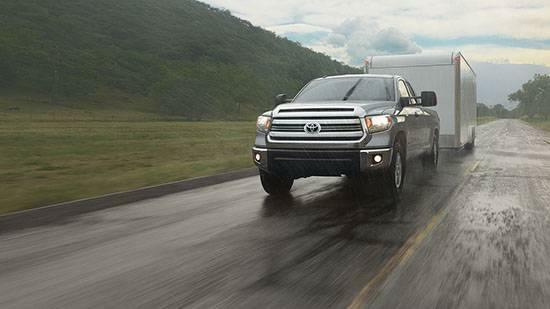 The 2019 Tundra is loaded with an impressive list of safety features geared at keeping its occupants safe. The Toyota STAR® Safety System includes Anti-Lock Brakes, Brake Assist and Smart Stop Technology, which is engaged when the truck senses an emergency situation and there is no action being taken. The system also includes Vehicle Stability Control, Traction Control, and Electronic Brakeforce Distribution which senses which wheel needs the most brake force and distributes the power accordingly. Also available is Blind Spot Monitoring which monitors the vehicle’s blind spots and alerts the driver with a flashing icon on the side mirror when there is a vehicle in the area that could pose a threat. Tundra comes equipped with an almost absurd number of standard airbags including driver and front passenger airbags, roll-sensing head/side curtain and front seat-mounted side airbags. The brawny and muscular look has been maintained for the 2019 Toyota Tundra. With a high stance, large wheel wells, and aggressive lines this truck looks like it is ready for a drive to the store, or a tour of your local backroads. There are three cab configurations – Regular, Double, CrewMax – giving owners a choice depending on what they need the truck for. The cabin is spacious and comfortable with ergonomic controls that are intuitively laid out and easy to use. The Tundra’s 60/40-split rear “jump seat” design can be stored with one hand in both the Double Cab and CrewMax, providing floor-to-ceiling storage. The huge centre console has 12V power and room for almost anything you would need to store. The large overhead console and locking glovebox provide more spaces for you to store your things safely. The 2019 Tundra offers integrated technology features like a 7-inch touchscreen with available navigation. This screen also houses the standard rear view camera with a park assist grid to make backing up easy. 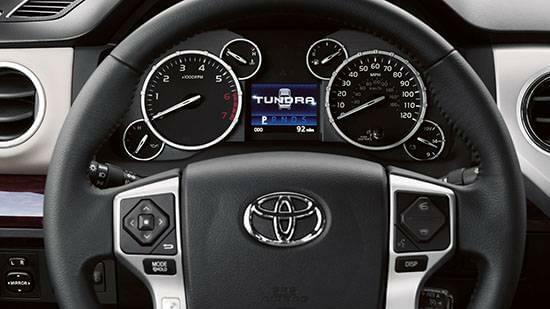 The Tundra’s audio system includes USB and auxiliary inputs, as well as Bluetooth® capability. All audio is easily managed from the standard steering wheel audio controls and the in-dash touchscreen display. Also available from the steering wheel controls is set-and-forget cruise control. There is a reason the Toyota Tundra has been around for as long as it has. Unparalleled reliability and more than enough power to get the job done, regardless of the job at hand. This truck has been the go-to for decades and 2019 is no different. 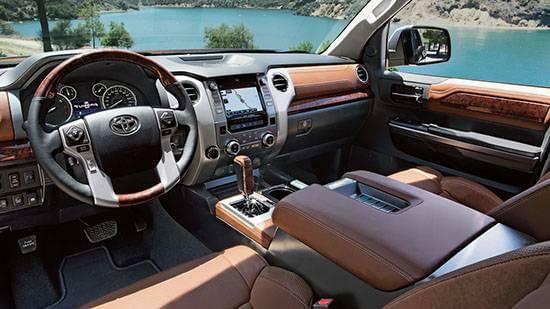 With a host of features to make your life easier and safer, the Tundra is for everyone. Come to Red Deer Toyota today to see the 2019 Toyota Tundra. We are located at 413 Lantern St, Red Deer County, Alberta or call our expert Sales Staff at 1-800-662-7166 to book a test drive. New vehicle pricing includes all offers and incentives. Tax, Title and Tags not included in vehicle prices shown and must be paid by the purchaser. Dealer installed accessories may not be reflected in sale price. While great effort is made to ensure the accuracy of the information on this site, errors do occur so please verify information with a customer service rep. This is easily done by calling us at (403) 343-3736 or by visiting us at the dealership. In compliance with AMVIC regulations, all new and used vehicle pricing includes freight / PDI, block heater (where applicable) and all fees. 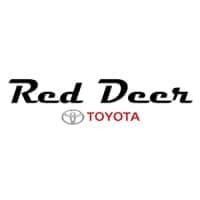 Red Deer Toyota	52.2098578, -113.8222557.